I walked away from St.Mary's not feeling as down as you would have expected. Yes, it was a draw and yes, Midtjylland had got the all important away goal, thanks to ex-Saint Tim Sparv, but Saints had started to show some of the form that we all knew they were hiding. Oh yes, Jay Rodriguez had scored his first competitive goal in ages, albeit from a penalty. I had forgotten all the joys of a Europa League game, the lack of any alcohol whatsoever inside the ground. Not being able to be sold bottled anything, the staff having to decant water, cola, etc., into plastic 'glasses' with the rigidity of a jelly. It was quite funny watching people struggle to carry more than one drink. The floors of the stadium were soon awash with spilt liquids. At least the excellent programme was free (thanks to the club for that, much appreciated). The team was unusual in that Maya Yoshida was at right back and fit again Stephen Caulker took his place alongside José Fonte in the centre. James Ward-Prowse came in for a rare start in place of Stephen Davis. Stekelenburg was in goal, Romeu and Wanyama anchored the midfield and Mané, Rodriguez and Pellè were up front. From the off, the first thing that occurred to me was that Saints were playing without much in the way of confidence. The build up was sometimes a bit laboured and the final pass too often went astray. 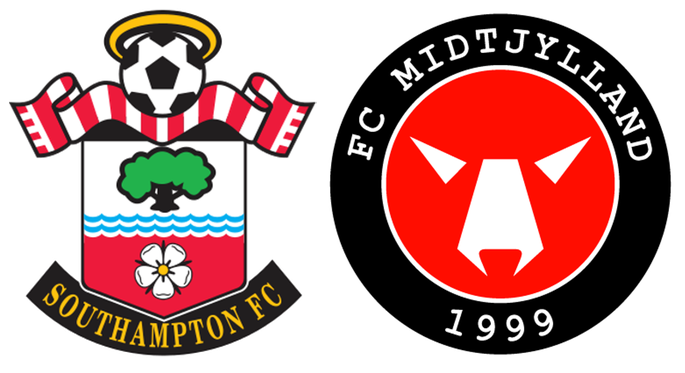 Midtjylland sensed that they could get something out of this game and began to put more and more pressure on Saints. The Danish side came with a reputation for being very good at set-pieces and proceeded to demonstrate why. Their main tactic seemed to be to get a throw-in somewhere deep in the Saints half and then launch the ball into Saints penalty area to see what would happen. Maybe that was one reason why we had three central defenders on the pitch, using their height to counter this threat. Whatever, they were very effective and on one occasion Stekelenburg was at full stretch to tip the ball around the bar. Even at this early stage Midtjylland were demonstrating the dark side to their game, by blatantly wasting time at every opportunity. This was to escalate to ridiculous levels later in the second half, of which more later. Gradually Saints were showing a bit more enterprise, with Mané showing a prodigiously high work-rate, Ward-Prowse at last showing the guile we knew he had and with a great dead ball delivery as well. New boy, Oriol Romeu continued to show the promise he first showed in the second half of the Everton game and up front, Pellè was winning everything, but somehow his teammates were not making best use of the knock downs. Jay Rodriguez was visibly growing into the game and was showing a real turn of speed. Although his timing is not quite there yet, he is clearly making rapid strides back to the player he was before his injury. It was from a seemingly harmless passage of play that the Midtjylland goal came, right on the verge of halftime. Saints seemed content to let the opposition play the ball around, but when the ball was eventually fired towards the goal, it was headed out by Yoshida. Unfortunately it fell right to the feet of Tim Sparv, who steadied himself and with his left foot, curved the ball into the bottom left of the Saints goal with Stekelenburg beaten. There was no time for any other action and the Saints team trudged off, almost unable to take in what had happened. At the start of the second half there was far more purpose to Saints play. There was a hint of the confident swagger of last season and Midtjylland were back-pedalling. Five minutes after the restart, the home side won a corner. Ward-Prowse sent over a perfect cross and it was met by the head of Caulker, rising above everybody to bury it in the Midtjylland goal. Unfortunately the referee then made a potentially costly mistake for Saints, in disallowing the goal for a foul by Caulker on a defender. Replays however, clearly showed that two of the defenders collided with each other, but that's football. However, we didn't have to wait long for the equaliser. Within five minutes a ball into the Danish penalty area was chested down by Pellè and Ward-Prowse was promptly hacked down by the Midtjylland No.2, Hansen. The referee had no hesitation in pointing to the spot. Jay Rodriguez stepped up and after a seemingly interminable delay slotted the ball home. 1-1. From this point on, Midtjylland's time wasting reached ridiculous levels. They were taking an age to take free kicks, throw in's and goal kicks. The number of 'injuries' was beyond a joke, with principal culprits being Hansen and Andersson. I counted Hansen alone falling down three times, each time when Saints were in the ascendancy and it very effectively disrupted play. The match continued to the end with Saints trying to beat these negative tactics without success and they are now faced with a difficult away game next Thursday.